Start walking through the world famous shopping street of Via dei Condotti, climb the Spanish steps and once you have reached Piazza Trinità de’ Monti turn around and enjoy the wonderful breath-taking view over the rooftops of the Eternal city. If the panorama makes you feel hungry and you want to escape from the crowds of tourists for a while, you might want to step inside the restaurant Trinità de’ Monti: Monica and Roberto would be delighted to have you as their guests for lunch, dinner or just for an aperitif. 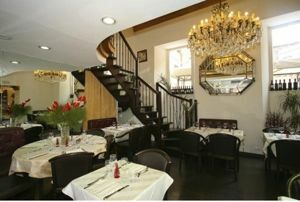 The restaurant is located right in the square of Piazza Trinità de’ Monti in what used to be a Valentino atelier. The interior centres around a huge chandelier and is designed with leather sofas and chairs. There is only a limited number of places available: this makes the atmosphere elegant but warm and cosy at the same time. We started looking at the menu and the wine list while sipping a nice glass of prosecco. There is a good selection of classical Roman dishes such as amatriciana, carbonara and cacio e pepe alongside other more sophisticated courses (€20-25). The wine list is accurate although perhaps slightly overpriced. Having been advised by the waiter, we decided to go for a seafood menu and ordered a delicately flowery and aromatic Muller Thurgau (€40). We started off with a fresh seafood salad (antipasto di mare) which included mussels, clams, prawns and crawfish. The ingredients were definitely of a high quality and combined well. For our main course we ordered a plate of Gragnano spaghetti (Gragnano being a town near Naples famous for its quality of pasta) with clams and a delicious plate of Cavatelli (a short kind of pasta) in a basil and mint pesto sauce with shrimps steamed in brandy. This latter dish was definitely worthwhile choosing. You shouldn’t pass up the chance to sample the second courses: a good selection of grilled seafood and meat. However, since the portions were quite large we decided to go directly for the deserts (€10-12): a strawberry tiramisu and a hot chocolate cake with homemade orange jam accompanied by a sweet Sicilian dessert wine (passito di pantelleria). The restaurant offers an interesting mixture of traditional Italian specialities together with some original recipes made with truly genuine ingredients: they are definitely worth trying. However, please note that the location, the extremely attentive service and the quality of the ingredients do come at a price.